As dusk turns to darkness, the palace of Deoksugung in the heart of Seoul is illuminated by vivid lights and silhouettes. 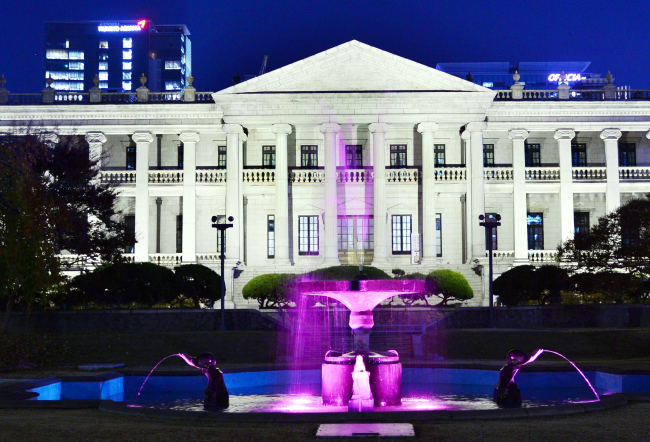 Visitors revel in the venue’s magnetic optics created by palace buildings from the Joseon Dynasty (1392-1897), including forested gardens, fountains and neoclassical structures. Deoksugung’s main structures are its principle hall Junghwajeon, two-story building Seokeodang, reception room Jeonggwanheon and Hamnyeongjeon, where King Gojong -- the 26th monarch of the Joseon Dynasty and first emperor of the short-lived Korean Empire -- lived and died. The Seokjojeon Hall and its Western-style garden exude neoclassical charm, as originally conceived by its designer, British architect G.R. Harding. 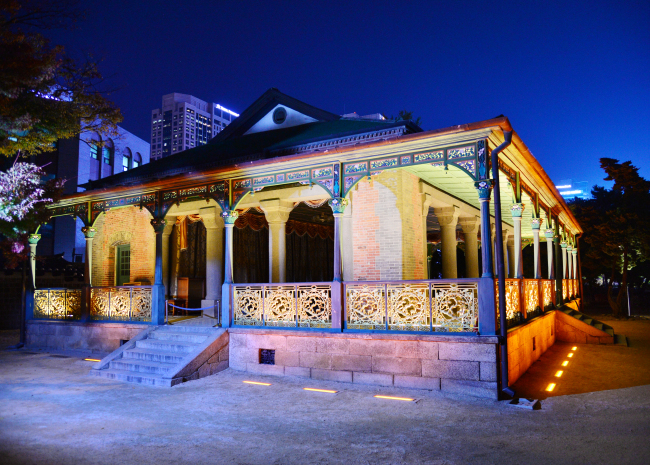 Seokjojeon houses the Daehan Empire Historical Museum, while its western building is home to the National Museum of Modern and Contemporary Art, Deoksugung Branch. Deoksugung was originally the residence of Grand Prince Wolsan (1454-88) of Joseon. It became a royal palace during the Japanese invasions of Korea (1592-1598) collectively known as the Imjin War, as the other palaces were burned to the ground. Walls surrounding the compound are illuminated at night, forming incandescent vistas out of darkness. 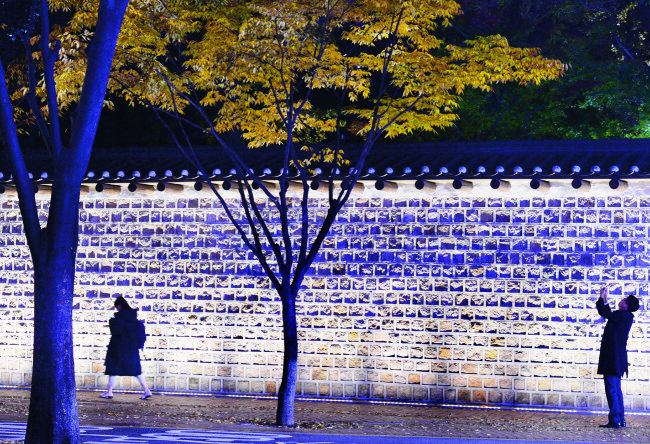 The Deoksugung Stonewall Walkway -- a 100-meter pathway surrounding the palace compound -- has been restored and opened to the public in August last year. The section forms part of the 170 meters of a 1.1-kilometer wall previously occupied by the British Embassy in Seoul. King Gojong’s Walkway, which stretches 120 meters from Deoksugung Stonewall Walkway to Jeongdong Park and the Russian Embassy, opened to the public in October. In front of its Daehan Gate, the Changing of the Royal Guard happens every day at 11 a.m., 2 p.m. and 3:30 p.m., except Mondays, national holidays and as subject to weather conditions. 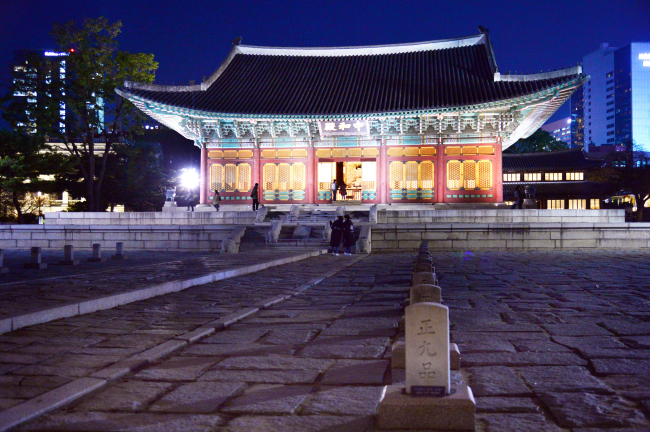 Deoksugung is open from 9 a.m. through 9 p.m. from Tuesday to Sunday, and closed Mondays. Nighttime admission is free for visitors under the age of 24, and 1,000 won for those over 24. For more information, visit www.deoksugung.go.kr or call (02) 751-0740.